Chilli jam was an unexpected creation. A good friend gave me about two liters (1/2 gallons) of frozen quince juice. When I boiled it and tasted to decide what to do with it, this jam came right up to my mind. Quince juice's tartness that was complimented by the kick from the chilli pepper, enhanced by added sugar. The taste was superb: I tried it on my sandwich, with a chicken, and in a salad dressing. I also had it plain with a tea. We loved it so much that it's almost gone. 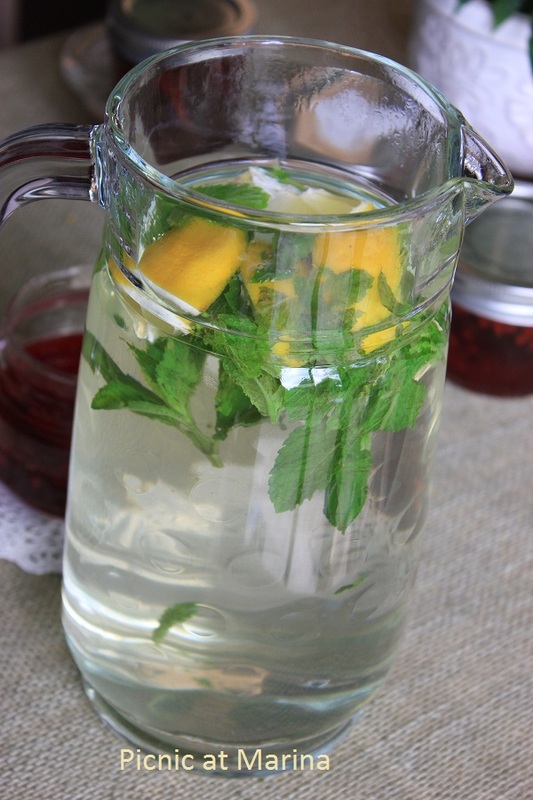 Have a cup of mint tea with a jam and come back for recipes. 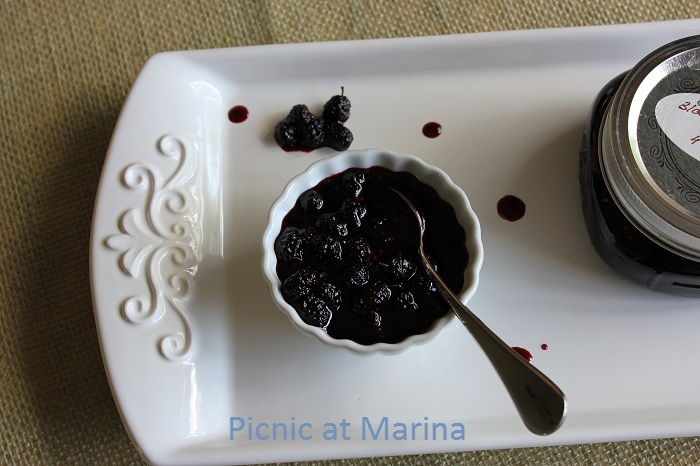 Holy cow...I am LOVING the sound of the chile-quince jam - YUM!! I am loving the taste of chilli-quince jam! :) Yum it is! 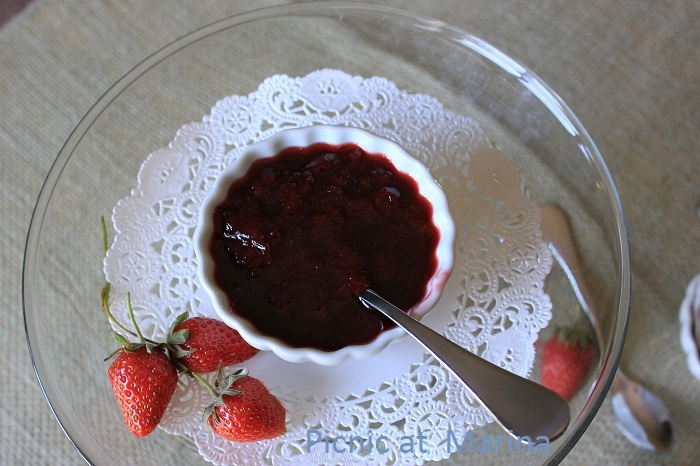 MMMM absolutely love strawberry jam. My all-time fave. I also love muscadine jam. Do they sell the muscadine jam? I don't think I've tried it. 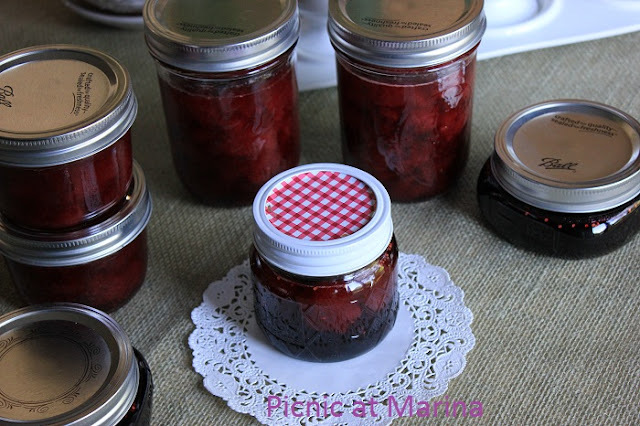 It's always so nice to make jam when fruit comes in season! 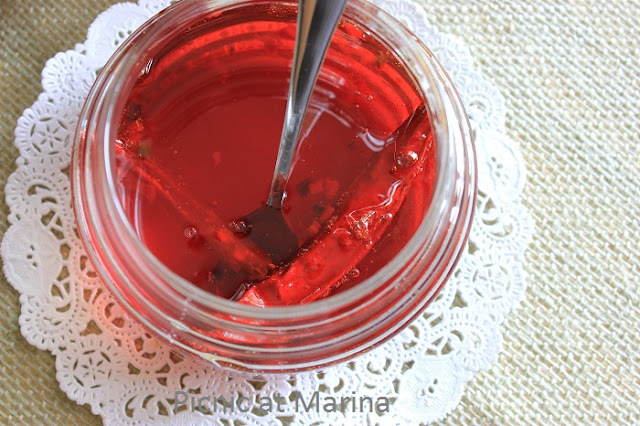 I used to make a pepper jelly that was hot...and sweet! I loved it on tuna sandwiches! Enjoy your weekend! wowwwwwwwwwwwwwwwww. what a delicious jams you got there, you really have been busy girl. those jams remains me the once my mother-i-law makes, she an expert on it, mmmm yummi yummi, You shopuld send a couple of jar to Costa rica, they are going to be well apreiated, I sure you that. jajajajajaja. I will take a good gla or a cup of that great mint tea you have there. Thanks Lorraine. It came as absolutely spontaneous idea but was tasty. Now I need to remember the recipe to make it again (when quince is in season). What a lucky family to have you making jam; I am impressed...chili jam sounds wonderful. I love chili jam and always have a jar in the fridge. I can't wait for jam season to arrive down under! 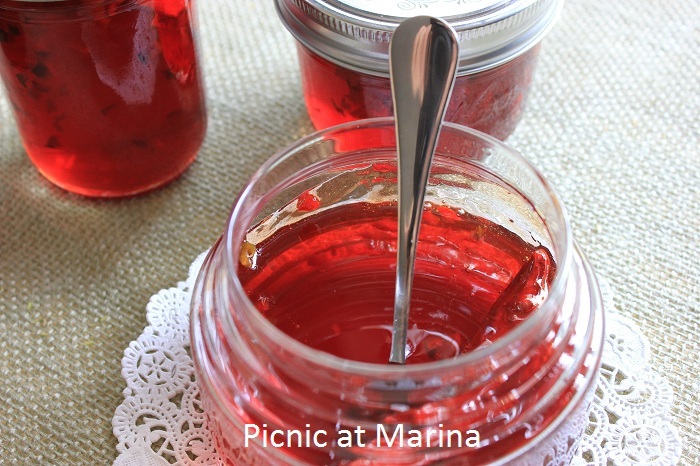 Your jams look so good. Do you make your chilli jam? I am hooked up now on this sweet yet spicy condiment. I make chilli jam too but have never considered chilli and quince - sounds like a lovely creation. Let me know if you try it. Is quince in season where you live? I also am intrigued by the chili jam! I have never had quince, so I have no clue what it might taste like! I love making homemade jam though ... so fun and delicious! Quince is in season sometime in late September-October, ask for it in the store and try. I love it! 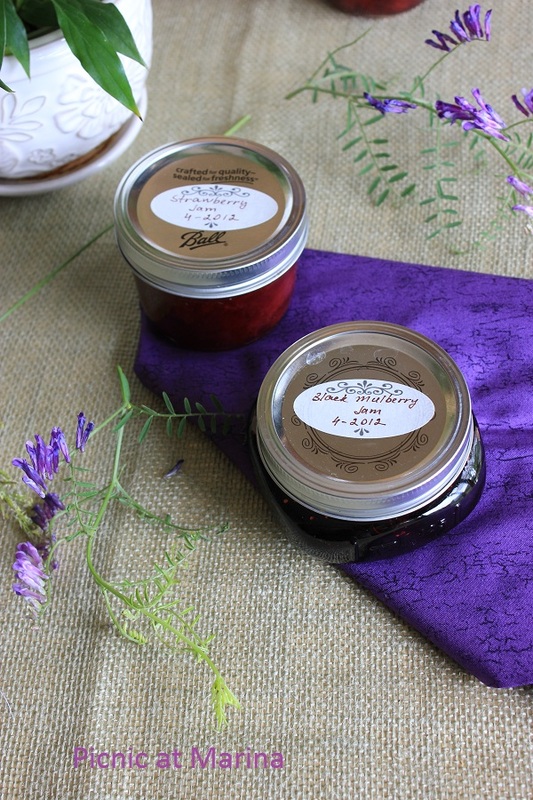 What a lovely array of jams...and beautiful photos! Thank you Lizzy. I hope to catch a little breath between the berries season: blueberries will be ready to pick in a month or so. Isn't it the best feeling in the world to look back over your creations after canning? I am inspired! Just lovely. I just picked up strawberries yesterday.... big strawberry area here and they are fantastic. It's the only berry we get locally.... Need jam! I love jam! I can't wait till the local fruit comes into season here! I love the assortment you have made! Have a great week! Thank you Joanna! Yes, it was a delicacy and it was gone in three days...:) When quince is in season I will make it again. You sure have been busy, very creative with the chili-quince jam, love the color. 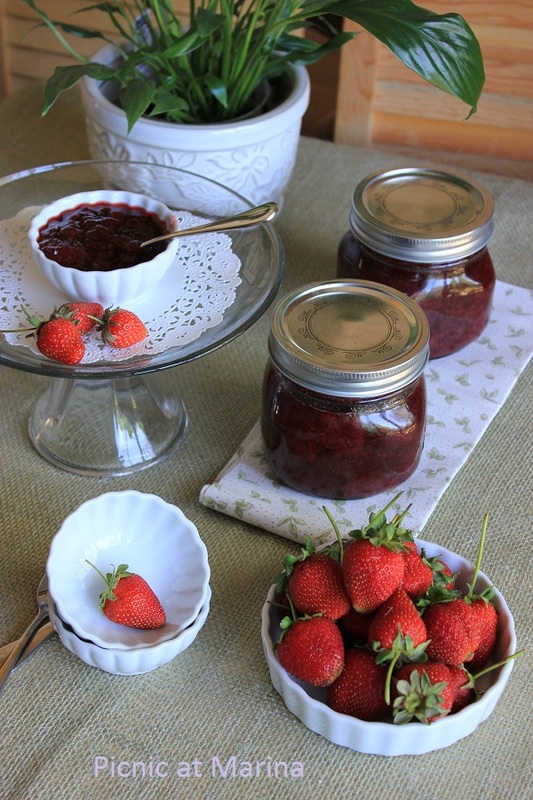 One day, I really need to try and make some jam, since I LOVE it!! Your strwaberry jam looks realy good. Ive never even had quince juice but you sure made amazing work with it - LOVE all this jelly and jam!